Macky Sall may be 30 years younger than his former boss, President Abdoulaye Wade, whom he has defeated in a run-off election for Senegal's top job. But he does not lack political pedigree. The 50-year-old geologist, who was brought up in a poor family, served as Mr Wade's prime minister between 2004 and 2007 and before that held the interior and mines portfolios. He also oversaw the successful re-election of Mr Wade five years ago, heading his electoral campaign - and went on to become president of the National Assembly. And he has twice served as mayor of his home town of Fatick, 120km (75 miles) south-east of the capital. But the politician proved he was no ruling party lackey when he dared to call the son of the outgoing president before MPs over allegations of mismanagement. Critics say Mr Wade, 85, had been grooming his son, Karim, to succeed him, pointing out that he was already running the powerful cabinet portfolios of transport and energy. Despite this, Mr Sall had summoned him for questioning about the alleged lack of transparency over the funding for the 2008 summit of the Organisation of the Islamic Conference (OIC). In the end, he resigned from his post in the National Assembly and from the ruling PDS party and set up his own movement, APR-Yakaar. Since then Mr Sall was at pains on his campaign trail to say that country should come before party and ethnicity. Image caption Mr Sall chose the horse as his party symbol as it is a "tireless worker"
Although he was born in the central town of Fatick, where most people speak Wolof or Serer, his parents are Fula people from the north of Senegal and he says growing up as an outsider has given him his vision. The symbol he chose for his new party was a horse, surrounded by stars - representing the 14 regions of the country and the one for the Senegalese diaspora. "These stars are associated with an animal, faithful among the faithful companions of man... [a] tireless worker. Pet of the peasant, the pastor and the ordinary citizen, the horse stands for strength," a speech posted on his party website says. And indeed Mr Sall campaigned tirelessly since branching out on his own - travelling to the US and France, the former colonial power, to seek support for his candidacy from potential investors. This is in stark contrast to Mr Wade who during his 12 years in power has sought to lessen Senegal's dependency on France. The BBC's Mamadou Moussa Ba in Dakar says Mr Sall is seen by some as too serious, and his campaign managers often urged him to smile more. The APR-Yakaar leader admitted to BBC Afrique that he has had little time for hobbies or for spending socialising with friends and his wife and three children since 2008. "I am too busy with politics - fighting for the Senegalese to get that man out," he said, referring to Mr Wade - whose nickname is "The Hare", an animal known in traditional Senegalese folklore for its cunning. Mr Sall, who took 27% of the vote in the first round, is part of the 23 June Movement (M23) which organised mass protests against Mr Wade's bid for a third term in office. The constitution, adopted in 2001, sets a limit of two presidential terms, but Mr Wade said it did not apply to his first mandate as it came into effect after he was first elected. The outgoing president faced 13 rivals in the first round and took 35% of the ballots. While some see Mr Sall as a new generation of political leader, critics say his supporters fail to see that he is really the creation of Mr Wade. Mr Wade once described Mr Sall as his "best student". 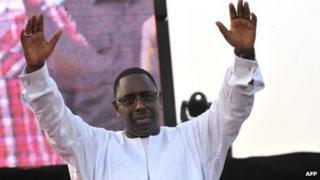 "Nobody can dismiss Mr Sall from what this [Mr Wade's] party has brought in negative terms to the social infrastructure of this country, in terms of destroying the democratic fabric and allowing corruption to develop exponentially," Senegalese writer and journalist, Adama Gaye, told the BBC's Focus on Africa programme. "I don't see him as being different from Abdoulaye Wade - really he is a Wade boy." Mr Sall's supporters, were keen to show that the differences between the men do not come down solely to age, pointing to his pragmatism in comparison to Mr Wade's intellectualism. In the end, Mr Sall managed to win the race dubbed by some as "the horse vs the hare". Mr Sall is now promising to reduce the cost of basic food stuffs and reduce the powers of the centralised presidency and its mandate from seven to five years.